First off, I must admit that I was rooting for the natural brand line. So I may have introduced a little bias from the start (this isn't a double-blind study by any means). I thought for sure it would whip the pants off of Heinz's Organic Ketchup, especially after the results of my last smackdown, where the major label failed miserably. In any case, the two brands involved in this competition were Naturally Preferred Organic Tomato Ketchup and Heinz Organic Ketchup. My first impression of the Heinz was, "who engineered this safety seal?" It took me about 3 minutes and a pair of kitchen shears to even be able to extract said Tomato Ketchup from the bottle. Very annoying. Next up was color and texture. Naturally Preferred was a deep red, almost like tomato paste with a similar consistency. In other words, not exactly smooth. But it was thick. 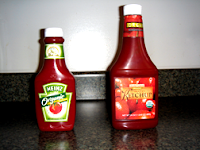 Heinz was the classically colored ketchup red with a very smooth consistency. Heiz totally won on appearance. Now for the taste test. Naturally Preferred had a clean tomatoey taste, but a little too acidic. Not as bad as generic ketchup that tastes like downed tomatoes that have been sitting on the ground for a few too many days, but a little distracting. Organic Heinz, surprisingly, had a much better flavor. At least one that tickled my memory taste buds of what good ketchup should taste like, but without the acidic aftertaste. The texture in the mouth was much better than Naturally Preferred (N.P. ), but I preferred (ha!) the thickness of N.P. over the Heinz. It was too runny. All in all, since both are manufactured from afar and distributed no where near where I live, they are even on meeting my "locavore" needs. Which means they get low points there. However, both are organic, so I'll still buy them if Muir Glen isn't available. But, hands down, Organic Heinz won. Even though I was pulling for Naturally Preferred, I have to admit, it just didn't taste as good.